I’ve been doing a lot of roleplaying lately, and I wanted to announce the release of something I’m very excited about… my latest full-length “official” D&D adventure with original illustrated maps, available in Dragon+ issue 21, Six Faces of Death!! My first D&D adventure for Wizards was The Barber of Silverymoon in Dragon+ issue 12 back in 2017. Inbetween working on a variety of other projects (which I’ll post about soon!) I finished “Six Faces of Death” this Summer. 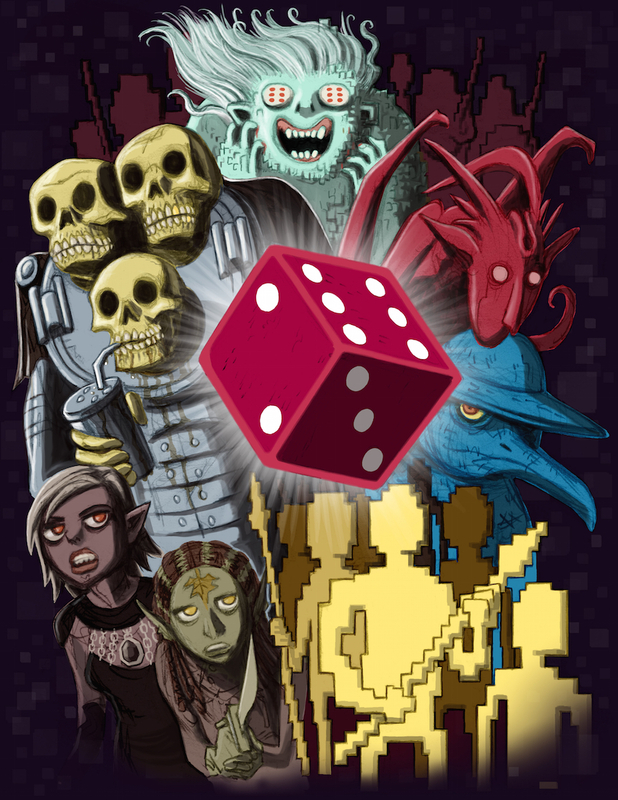 “Six Faces of Death” is a horror-ish (or, as the Wizards blurb calls it, dark fantasy) D&D adventure for adventurers of 11th to 13th level, featuring monsters from “Mordenkainen’s Tome of Foes,” just as “Barber of Silverymoon” featured critters from “Volo’s Guide to Monsters.” The creatures in “Mordenkainen,” however, are much nastier, which inspired a much more gruesome (and bigger) adventure. If you play D&D or similar games and like my artwork, please check it out! My own taste for this adventure is to run it deadly with minimal help or effective communication from the various NPCs, but if you want a less harsh game you can play up the NPCs’ goofy personalities and have the talking monsters initiate conversation with the PCs rather than simply slaughtering them as soon as they go in the water/turn their backs on them/show weakness/etc. Players: be cautious when your ship approaches the mysterious waters of Changing Island! Dungeon Masters: if you like weird fiendish imagery, interparty paranoia and describing gross objects, this is the adventure for you. Many thanks to my editors, Bart Carroll and Scott Fitzgerald Gray, who polished and improved the final product, and to my <3 Jumana Al Hashal for color assist. If you play the adventure, comment or Tweet to me and let me know how it goes! Have you ever gotten tired of all the other shiftless adventurers Carousing every night while you just want to make sure the party has enough iron rations? Do you enjoy browsing the bazaars, alleyways and merchant stalls for rare treasures and mystic items from across the seven seas? Then the D&D Shopping Table is for you! The shopping table can be used to simulate shopping either for common items (simple weapons, light armor, etc.) or rarer items (specialist tools, trained horses, gems, mirrors, books and scrolls, magic items, etc.). If an item is particularly common (fish, wheat, timber, bricks, farming equipment, etc.) the DM may rule that it isn’t necessary to roll on the table, unless the player really wants a random adventure. The exact amount of time it takes to shop (and thus roll on the Shopping Table) is up to the individual DM. This writer’s assumption is that shopping takes a full day, but the DM may rule that looking for a particularly rare item may take a week or more. Characters shopping in a group don’t stack modifiers, but may use the most advantageous background. However, groups with Nobles, Knights and Courtiers, while they may have an easier time finding items, will find themselves paying inflated prices. If a friendly merchant, noble or criminal NPC accompanies the characters, the characters may use the NPC’s background bonus. Backgrounds that aren’t listed here have no shopping benefit or drawback. Criminal: Add +10, but only when using the Black Market. Urchin: Add +5, but only when using the Black Market. Urban Bounty Hunter: Add +5, but only when using the Black Market. Sailor: Add +5 if in a port city. Pirate: Add +10 if in a port city and using the Black Market. BLACK MARKET OR RESPECTABLE MARKET? Before rolling on the table, you must choose whether you are shopping on the Black Market (using criminal contacts) or in the Respectable Market. If a shopper fails to find something in the Respectable Market on one day, they may try again in the Black Market (or vice versa) on the next day. If you shop on the Black Market, you’re able to find rare items which aren’t as easy to find in the “Respectable” Market. The exact distinction between “common” and “rare” items is up to the DM. The DM may also rule that certain “very rare” items aren’t available even on the Black Market, unless you roll high enough and get certain results. If you choose to shop in the Black Market, subtract -10 from your roll, unless you have a background (Criminal, Urchin, Pirate, etc.) which gives you a bonus to shopping on the Black Market. The DM may rule that certain towns are so corrupt and seedy they don’t have a Respectable Market. Likewise, the most strictly Lawful communities may not have a Black Market. 15 or less Bad results! Roll on the Black Market or Respectable Market subtable. 1. The local authorities raid the black market and arrest everyone! (Roll to see if the raid happens before or after you buy the item; odd=before, even=after.) The criminals may surrender or attempt to flee, but the city guards bring overwhelming numbers. You may try to fight anyway (a deadly encounter), or use Stealth, Performance or Deception to talk or sneak your way out. If caught, you end up in jail for 2d10 days, or you may bribe your way out for 1d10x100 gp. 2. It’s a sting operation aimed at you specifically! Roll Wisdom (Insight) DC 16+1d10 to see if you detect that the ‘merchant’ is actually a city guard, merchant guild sneak, or rival noble trying to catch you in the act. If you fail, you end up in jail. They don’t really have the item anyway. 3. You buy the item, but as it’s illegal, a powerful enemy (perhaps the very criminals who sold it to you) attempts to blackmail you afterward. 4. You are mugged by a powerful, prepared band of criminals. Roll to see if they attack before or after you find and buy the item you seek (odd=before, even=after). If you or someone accompanying you makes a Charisma (Intimidation) roll DC 25, the criminals avoid you. Otherwise, the DM creates a deadly encounter for your level. 6. You are mugged by a band of criminals in collusion with a merchant. Roll Wisdom (Insight) DC 15+1d10 to see if you detect the merchant’s ill intentions. Otherwise, you are surprised on the first round when you are attacked: the DM rolls up the criminals as a (1-2) medium, (3-4) hard or (5-6) deadly encounter. 2. You offend the local merchants’ guild. You can buy any common items if you want, but all prices on this general class of items (food, weapons, armor, magic items, etc.) are at x2 until you somehow make amends. 3. A local merchant offers to sell you the item you seek– even a rare or very rare item!– but only after you either (1) work for them for 2d6 weeks, (2) marry their son or daughter, (3) attend at the birth of their son or daughter in 2d6 days or (4) adopt their infant son or daughter and take them with you on your journeys. 4. You are tricked into a long-winded sales pitch lasting hours. Roll a Wisdom saving throw (DC 12) or you gain 1 Exhaustion level. 5. You eat or drink something bad among all the many samples of food and drink thrust upon you by overfriendly merchants. Roll a Constitution saving throw (DC 12) or you become poisoned until you have a long rest. 6. Scratch that about finding the item. The item is only available on the Black Market, and you must try again on another day. 16 You somehow offend the God of Merchants and become cursed. The exact effects are up to the DM (sample curses: all precious metals you touch turn to lead, dogs howl at you, you attract snakes and scorpions, you lose the ability to do simple math, you always blurt out exactly what you’re thinking and have disadvantage on Deception, a small rain cloud follows you everywhere, etc.) It can be cured by greater restoration. 17-18 You are able to find a common or even rare item, but you are mugged by experienced criminals. Roll to see if they attack before or after you find and buy the item you seek (odd=before, even=after). If you or someone accompanying you makes a Charisma (Intimidation) roll DC 20, the criminals avoid you. Otherwise, the DM creates a hard encounter for your level. 19-22 The item is cursed or ruined in some subtle way. Roll Wisdom (Perception) DC 15+1d10 to detect the flaw before you buy. If it’s food or drink, it’s poisoned or infected with disease. If it’s weapons, armor, raw materials or tools, it has a hidden flaw which manifests in 1d10 days, rendering it useless. If it’s a magic item, it is sought by a cult or possessed by an evil intelligence. 23 Unbeknownst to you, the item is stolen, and the original owner will try to reacquire it by legal or extralegal means. 24-27 You find the item, but its cost is x2 to x4 (1d3+1) normal. A loanshark (perhaps the merchant themselves) offers to advance you the extra money to but the item if you need it, but their interest rates are steep, and they have connections to the authorities (or the criminal underworld…). 28-29 A merchant knowingly attempts to sell you a forgery, or defective or shoddy merchandise. If magical, the item is dweomered to appear to seem high-quality unless an identify spell is cast. Roll Wisdom (Insight) DC 15+1d10 to sense the merchant’s ill intentions. If this roll fails, you may roll an appropriate Intelligence check depending on the type of item (Nature, Arcana, History, Religion, etc.) DC 15+1d10, to detect the falsehood or poor craftmanship. 30-31 A merchant unknowingly attempts to sell you a forgery. If magical, the item is cursed (undetectable except with identify; roll to see the severity of the curse; 1-2=merely annoying, 3-4=permanently crippling, 5-6=potentially fatal). If it’s not a magic item, roll an appropriate Intelligence check depending on the type of item (Nature, Arcana, History, Religion, etc.) DC 15+1d10, to detect the falsehood. 32-33 You are mugged by criminals. Roll to see if they attack before or after you find and buy the common item you seek (odd=before, even=after). If you or someone accompanying you makes a Charisma (Intimidation) roll DC 15, the criminals avoid you. Otherwise, the DM creates a medium encounter for your level. 37-38 You are mugged by lowlife hoodlums. Roll to see if they attack before or after you find and buy the item you seek (odd=before, even=after). If you or someone accompanying you makes a Charisma (Intimidation) roll DC 12, the criminals avoid you. Otherwise, the DM creates a easy encounter for your level. 39-40 The items are functional, but aesthetically unpleasant; weapons or armor have an old-fashioned or ugly design or are marred and scratched, food is edible but stinky, etc. 41-44 You are distracted by something enticing to you: the smell of ale from a tavern, a pleasant garden, a library, a shrine to your deity. Make a Wisdom saving throw (DC 10) or you spend the day exploring this activity instead of shopping. If you succeed, reroll on this table. 45-46 Bad weather (rain, snow, oppressive heat) interferes with the market day. Make a Luck roll of 1d20; on a 1-10, the merchant you seek goes home and can’t be contacted. 47-48 The shop is closed today; or, if you’re in an unfamiliar city, you receive confusing directions and wander all day without finding the shop you seek. 49-50 You are distracted by another item which wasn’t what you were looking for. Make a Wisdom saving throw (DC 10) or you end up buying the other item(s) instead, costing (2d6)x100% of what you would have spent on the item you wanted. You may or may not regret your impulse purchase later. If you succeed on the save, reroll on this table as you continue shopping. 51-52 The local merchants don’t have what you seek, but they do know in what city or town it can be found, even if it is a rare or very rare item. Roll 1d20 for approximate distance (1-5=any town the DM wants anywhere on the map, 6-10=about 2 weeks’ travel away, 11-15=about 1 week’s travel away, 16-20=the next town over) Otherwise, you can’t find this specific item in town no matter how hard you look. 53-54 The merchant dislikes you for some reason. Make a Charisma (Persuasion) roll DC 20, or the price on the item you seek is at x2. If you roll a natural 1, the merchant outright refuses to sell to you. 55-56 The merchant is superstitious and sees a bad omen (a bird, a snake, a strange cloud, etc.) indicating they shouldn’t sell to you today. You may make a Wisdom (Religion) DC 18 roll or cast a spell like augury to convince them to sell you the item. 57-58 The merchant has the item but won’t accept coin. If you want to buy from them, you must trade in goods or services. 59 You see an unpleasant scene between the merchant and one of their staff or customers. 60-63 The merchant considers business deals to be formal celebrations, and insists that you spend the day and night with them (and their family or business partners) in drinking and festivities. Roll on the Carousing table. Afterwards, you can buy the item you seek– even a rare or very rare item!– and the merchant becomes a friendly contact; in addition, make a Constitution saving throw (DC 15) or you wake up the next day with 1 Exhaustion level. 64-65 The merchant has personal problems (dying of a disease or curse, indebted to criminals, scorned because they are the only tiefling in town, etc.) and may seek your help, or merely inspire your pity. If you can help them, they sell you the item for 50% of the normal asking price. 66-67 The items you buy are unexpectedly aesthetically pleasing (particularly beautiful and well-crafted weapons or armor, fine-smelling food or wine, etc.). 68 Today is a sacred day for the God of Travellers and Merchants, or otherwise has auspicious omens, making the merchants extra friendly. You can buy a rare or very rare item if you buy from a priest or temple, today only. 69-70 The merchant has an unusual background (the only lizardman in town, a worshipper of a foreign god, an immigrant from another city, etc.). 71 There’s something interesting about the merchant’s family. 73-74 The merchant is fond of you, either because of your personality or because you share a cultural, racial, or background connection. You can buy any item for 75% of the normal asking price. In addition, the merchant becomes a friendly contact. 75-76 The merchant is fond of you because you remind them of someone they know. Are you perhaps related to them? Or do they know your family? You can buy any item for 75% of the normal asking price. 77 A street fair or religious festival interferes with market day. If you participate, make a Persuasion or Performance roll (DC 15). If you succeed, you gain +10 on the next day’s shopping or carousing roll (your choice). 80 The merchant has unusual guards or traps, which you somehow catch a glimpse of. 81 The merchant has an interesting or unusual pet, perhaps a monster. 84-85 The items are of unexpectedly high quality, a fact the merchant either proudly tells you, or which you discover when you buy them. Food is extra-fresh, tasty and nourishing, horses are faster, armor is unusually handsome and durable, etc. The DM determines the exact benefits. Magic items have an additional small power. 86-90 You’re in luck: the merchant has access to a special item, one not normally available even by the standards of rare goods. If you’re shopping in the Respectable Market, you find a rare item; roll again, ignoring a result of 50 or lower. If you’re shopping in the Black Market, you find a very rare item; roll again, ignoring a result of 50 or lower. 91+ Good results! Roll on the Black Market or Respectable Market subtable. 1. The local criminal gang sells you the item, and they like you. You gain a friendly criminal contact, and while in town you can make an Intimidate check as a bonus action (once per encounter) by saying the criminals’ names. In return, the gang may ask you to help with a small matter or two. 3. While negotiating the sale, you witness a brutal crime perpetrated by the criminals you’re buying from. In an attempt to buy your silence, they offer you the item for a 10%-60% discount off the normal asking price. 5-6. You’re in luck: the merchant has access to a very rare item, one not normally available even by the standards of rare goods. 1. The item you purchased has a noble pedigree in this town, and everyone who sees you with it recognizes it and treats you with respect. (Gain advantage on all Persuasion rolls in town for 1 week, +10 on future carousing and shopping rolls). 2. You gain a friendly contact with the head of one of the merchant guilds (i.e. food, weapons, armor, magic items, idols, etc.). You can buy this type of item for 50% of the normal asking price in this town in perpetuity (or until you abuse this privilege so egregiously that the merchants rethink their fondness for you). 4. Along with the item comes a trusted servant who is an expert on the item’s care and maintenance, and offers useful (though possibly long-winded) advice. 5. The merchant is from the old noble families of the area, and knows everybody and everything in town. You gain a friendly noble contact. 6. You’re in luck: the merchant has access to a very rare item, one not normally available even by the standards of rare goods. If you like this table, please consider checking out some of my Dungeons & Dragons Adventure Walkthrough Map prints or the Ancient-World Priestess Class for D&D5e available on DM’s Guild!